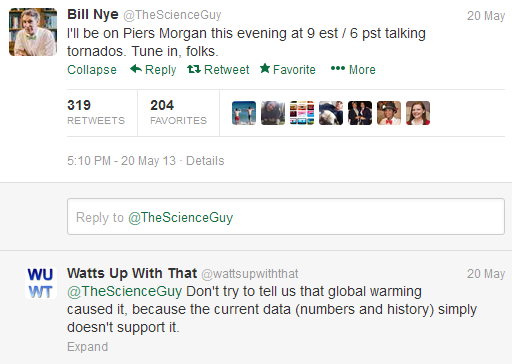 Bill Nye the clueless weather guy – flattened by tornado data | Watts Up With That? “Yid with Lid” ran this scathing headline (in the screencap below) yesterday, and pointed out why Nye just doesn’t have a clue. The tornado data following eviscerates Nye’s claims, who seems unable (or maybe unwilling) to Google his own claims for accuracy before bloviating them on CNN. The screencap source at “Yid with Lid” is here, and the article goes on to explain and prove the headline correct. But, while Nye is taunting Inhofe, his own claims go up in flames with a simple examination of data. During CNN’s live coverage of the deadly Oklahoma tornado on Monday night, host Piers Morgan and Bill Nye speculated on the possible role of climate change in the disaster. “As a scientist, when you hear about the size, scale, power, devastation of this tornado, what does it tell you about the ongoing debate about climate change?” Morgan asked his guest. “Thunderstorms are driven by heat and a tornado is a super thunderstorm — result of a super thunderstorm. So you’ve got to figure that if there’s more heat driving the storm then there’s going to be more tornadoes. Now this is the kind of thing that is worth investigating,” he added. I agree, it is worth investigating, all you need is about 20 seconds on Google to figure out Nye’s claim is totally unsupportable. This is a map and list of tornadoes since 1950 which the National Weather Service has rated F5 (before 2007) or EF5 (equivalent, 2007 onward, the most intense damage category on the Fujita and Enhanced Fujita damage scales. The tornadoes are numbered in the order they happened since 1950; so the numbers run from the bottom up. NOTE: Since the (E)F-scale is a subjective damage assessment tool, official NWS ratings (as logged in Storm Data and in the NSSFC/SPC database) may differ on occasion from those of other tornado databases, such as those of the Tornado Project or University of Chicago. The majority of violent tornadoes occurred in the cooler periods of US history. …gets flattened with a simple inspection of temperature and tornado data. If Bill Nye really is a “Science Guy”, you’d think he’d want to check his claims against real-world data before going on international TV, especially after being admonished to do so. Apparently not. His twitter profile says “Science Educator seeks to change the world..”, rather than to educate about science. Time for WUWT to talk with Piers Morgan? Just another low-information (and not caring) activist. In general, colder conditions produce more storminess, due to steeper temperature gradients. Glacial phases of ice ages are stormier than interglacials, such as now. In the solar system, the colder the planet, the higher its winds. Nye is not a scientist. He was a mechanical engineer and training presenter at Boeing during the day and a local standup comedian in Seattle when he was tagged the “science guy” while being a know-it-all spelling nazi with a local television show’s host. The host, btw, was actually funny – Nye not so much. Disney later exploited the science guy meme and Nye’s popularity as the nouveau Mr. Wizard was settled among the facts challenged. It would be best for all to not take this guy too seriously. He has no qualifications in climate science or any other science that prepares him to speak as an authority on climate matters. Bill Nye used to be funny, and he used to make cool shows about science for kids. Now he just acts like a juvenile and rambles on in incoherent ways that would be funny if he were on a Monty Python skit. Of course, as is, while laughable and ridiculous, it is mostly just sad. It makes me wonder if he is being paid to act so pathetically. To Anthony, thanks for the ready compilation of references and facts. 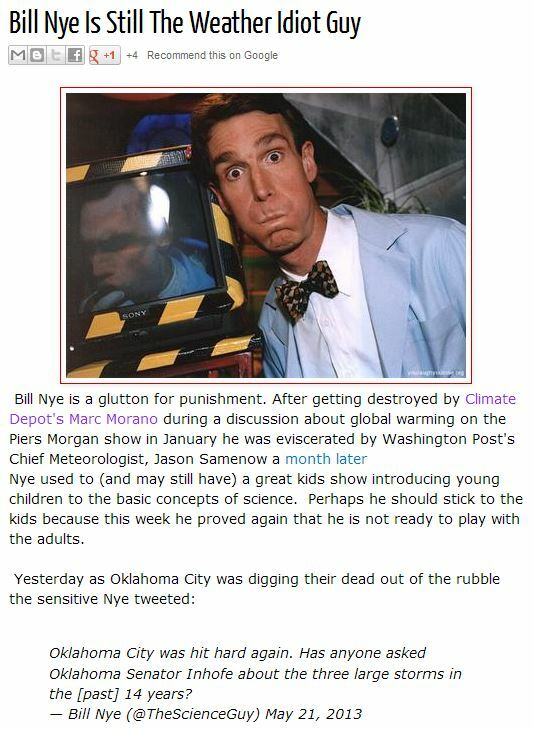 Is the end for Bill as “the Science Guy” nigh? Will U take him back? Bill Nye, if you’re reading this, you came across much better when you were skeptical of human-induced global warming. Yup, I recall you on CNN not so many years ago. Interesting, pre-1983 EF5 tornadoes were February through December, post-1983, March through July. Long before Bill Nye got national exposure, he was on Seattle’s “Almost Live”, where half the time his science demonstrations failed on live TV. He was better as one of the High Fivin’ White Guys or as the semi superhero Speed Walker. Those roles were supposed to be pathetic. Paul Homewood, on his site http://notalotofpeopleknowthat.wordpress.com/2013/05/22/bill-nye-makes-a-fool-of-himself-again/ carries out a fairly detailed examination of Nye’s claim against the data. That’s also worth a look. I have often thought of stroms in terms of a heat engine. What is important in the thermodynamics of heat engines is not absolute temperature per se, but the temerature difference available to convert heat energy to mechanical energy. The claim that storms will get more violent with “global warming” is not logically (or scientifically) supported by their (the global warming zealots) very own general circulation models which universally predict that the poles will warm more than the tropics, in which case the temperature differences available to make big storms will be smaller. From the apparent evidence in the tornado count shown above I interpret that it is likely that the converse proposition, that cooler “global” temperatures create larger available temperature differences that will make storms more violent, is more likely. Bil Nye really is an apology for a human being. How disgusting for anyone to be selling their false beliefs off the back of the victims of this natural weather event. What does this say about any TV channel that allows this person to invade our screens. If advertisers are not offended by this then they should be. We don’t want Piers Morgan back. In the June issue of Popular Mechanics, there is a tribute to Fathers, for Fathers Day, article with snippets from the standard go to establishment spokes-mouths, including the “science guy” for the Sesame Street set. The Nye guy’s dad….”called himself Ned Nye, Boy Scientist. His life was changed and shaped by four years in a Japanese prisoner-of-war camp in World War II.” It is sad that Ned apparently did not adequately describe this Hell, or that Bill has not invested any time into the elite stage setting that created that Hell, the previous Hells and the worlds pending Hell. The Japanese imperialism was created, nurtured and maintained by Euro elites, first to counter Russian expansion, then to destabilize China, who’s leaders had traded a millennium of silk and spices with Europe, but only for GOLD. This one way exchange had depleted western Gold stocks, and every effort was made to ‘recapture’ this economic base material. As Japan closed in on this stockpile, the Chinese emperor loaded six US battleships with gold and sent it to Ft Knox for ‘safe keeping’. To understand the economic hand that directs our puppet show reality, see the your tube video “All Wars Are Bankers Wars” and read “The Creature from Jekyll Island” by G Edward Griffin. 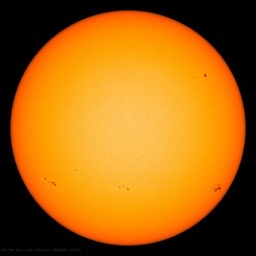 AGW is puppet science will remain unaffected by empirical evidence until exposed as elitist directed manipulation. Ned had no access to watches as a prisoner, so developed an interest in sundials, later patenting the “Sand-dial” for beach goers who didn’t want their Timex to take a licking. Bill honors his dad by saying….”his love of sundials stuck with me. I think he’d be proud to know I helped put the first sundials on Mars”. No Bill….i think your dad would be proud if you discovered the lies that created his four years of Hell and did ALL THAT YOU COULD DO TO PROMOTE TRUTH. Placing a token time piece on a remote planet is of no value to anyone. Narcissistic cognitively-dissonant piehole flapper (or “media celebrity” for short). Bill Nye, the “science” guy. There, fixed it for you. When he utters his conflab on CNN, he does so with his eyes closed. Notice that? A sure sign of deception. Here’s a prime example of someone who really should ‘take the 5th’… forever. Caught his speech at the Lehigh University commencement on Monday, where he proclaimed that there is probably a virtual “endless supply of fossil fuels” for at least a couple of centuries and that we shouldn’t waste them. He left his most caustic comments for nuclear energy. It used to be, that birds twittered. Iowa’s longest stretch without a tornado (359 days from May 25, 2012, to May 18, 2013) ended when several twisters were spotted on May 19. Previously, Iowa’s longest spell of tornado-free weather lasted 355 days in 1955-56. I wonder if Bill Nye will highlight this interesting data. His insinuations and claims (and those of Sen. Boxer) are so ludicrous and are so comprehensively exposed as factually incorect they cross from valid opinion to outright dis-information. In fact, let’s cut to the chase: he lied. A few more facts here that The Science Guy forgot to check. i am simply a layman but even i know storms are driven NOT by heat, but by the clash between the cold air mass and the warm air mass,and tornadoes happen when the UPPER air currents are moving in different directions, this cause a “rolling” of the air between the directional differences and then a storm gets some uplift into the spinning air and causes it to tilt and sometimes reach the ground as a tornado……..remove the different wind directions in the upper air and you dont get tornadoes. I was a member of the Planetary Society since the beginning in 1980. Last year I declined to renew. Couple of months ago they called up to ask me to renew. I told them that as long as Bill Nye is the current president, I’ll have nothing to do with them. Bill Nye reminds me of Dr. Karl in Australia. Both have wiped out any positive stuff they ever did by getting on this sinking ship. Science has become scienciness in true Colbert fashion with these guys. Back in 1975 they were blaming tornadoes on global cooling. Were they lying then or lying now? Joseph A. Olson, you have a unique view of history. Puyi, the last emperor of China, abdicated in 1912, and the monarchy was officially abolished by China in 1916. There was no emperor to send gold to the USA in the years leading up to WWII. It is unlikely, in any event, that we would send six battleships to transport gold, and, if we had done so, the battleships would have had a great deal of difficulty in reaching Kentucky. Strange thing is…. They could make an argument that AGW affects tornadoes. The formation of tornadoes relies of both warmer air AND cold air, something Nye doesn’t seem to know. Global warming might be affecting the frequency of tornado formation because it’s causing a decrease in cold systems aloft, making larger tornadoes LESS likely. And the real world observations provided by NOAA supports that hypothesis, as the trend of observed larger tornado occurrences does seem to have decreased a bit over the years. But a trend of LESS larger tornadoes just isn’t useful to the global warming alarmist industrial complex, so they’re not going to follow what the real world observations seem to be suggesting. Joseph I need references for the claims about gold being shipped to US. There are no International Court of Justice cases involving the Federal Reserve and China. The claim of 200,000 tons of gold being moved to US is hard to swallow as the US claims to have a total of 20,000 tons. Nye said climate change has to be considered after a catastrophic weather event like the devastating tornado in Oklahoma. Tornadoes are definately more devastating and catastrophic today than say back in 1888 when they would have caused hardly any damage at all. Why? Because Oklahoma City did not exist. It was settled in 1899 and has grown to over 1.3 million people today. That is a big target which wasn’t there not that long ago. To be scientific the amount of devastation caused by a storm is not a useful measure of anything as the amount of people and the value and amount of their possessions keeps on growing. Here is the giant hole in using the frequency of “strong” tornadoes as rated on the Fujita and Enhanced Fujita scales; the scale rates a tornado’s strength based not only on objective measurements of wind speed but also on the amount of damage that it causes. So as land use has changed (from rural/farmland to suburban) the amount of damage a tornado can do has increased. Until someone invents a way to normalize current tornado damage to historical land usage (or vice versa) it is impossible to know if the frequency and strength of tornadoes have increased. Lying about the weather to kids is as creepy as can be. Since he is also still loved by so many immature but creative geeks, activists included, the stormy backlash will be quite a blowout indeed. The skin of the entire left side of the political equation is beginning to crawl. Anyone ask Bill Nye about April 1974? I’ve searched through all the posts above but cannot find where Olson claims that 200,000 tons [or 20,000 tons either] were sent to the US. Can someone please point me to the Olson post that makes that claim? Thanks. From his show long ago, there was one good piece of advice that we should all take to heart: “Extraordinary claims require extraordinary evidence” (after Laplace, I think, though he didn’t give attribution). If you debate again, consider quoting that back to him. It look from the graph that F3 to F5s have been going down with all the better detection we have nowadays. And during the ‘hottest’ decade on the record. It is not true that tornadoes are classified based on the total amount of damage they cause. They are classified based on the *type* of damage they cause. A 100 mph wind causes a certain level of damage to structures and trees. A 200 mph wind causes a different level of damage to structures and trees. The difference was as obvious in 1913 as it is in 2013. Whether this damage is only in a small area or along a path a mile wide and several miles long and whether or not there are only fields and trees in the path or neighborhoods and schools does not affect the rating of the tornado. Normalization is not necessary. A couple of interesting things. First of all, people always refer to “tornado alley.” I wonder what that means? The number of locations, running West to East, south of Oklahoma’s northern border is the 2nd largest number. The largest number is from West Texas and South central Texas up thru central and eastern OK, up thru central and eastern KS and far western MO, up thru the middle of IA and on into Wisconsin. That appears to be the true alley. If you show this temperature graph to any continental US citizen (1.2% of the earth’s area [I think]), they would probably say that global warming is obvious. We all know about the other 98% of the world, but, most of them do not. 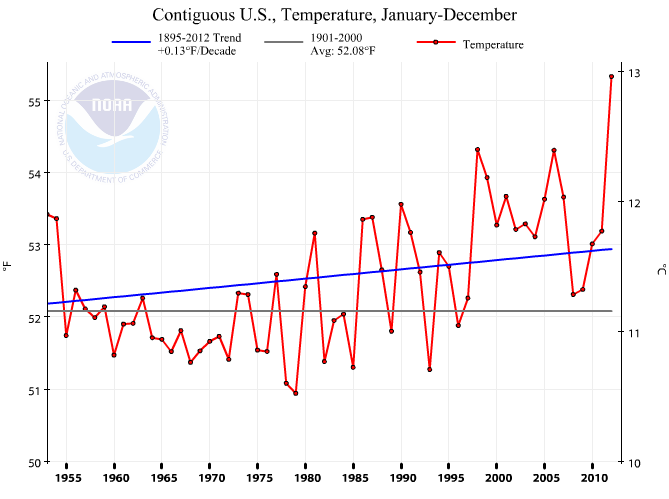 Also, I am not that good at math, but since 1955 the temperature trend is up, but the average is down? I know that is possible, but I think that means that the average the first 55 years was really high? In was a great day, last Monday at Lehigh, as my daughter was graduating(with a job). I was looking forward to a day of inspiring speeches, happy students, proud parents and the joy that graduation brings. All those things happened. Even the weather held a perfect balance…no rain and not too much sun. However, your speech was a little discordant. You are a good Public Speaker and being in front of a large live crowd must be a little tough, but your don’t have children and we are killing Mother Earth because of Co2 rant was kind of sad. Your going on Piers Morgan that night were you lied about tornadoes was brutal. The class of 2013 will as you said “Change the world”. They will do this being positive. The future belongs to the brave. Tornado activity has declined these last fifty years. Why do you not say that? According to climate models(that you believe in) the poles warm faster than the equator thus lowering the difference between hot and cold…less storms…less severe weather. Why do you not say this? Bill Nye was the main commencement speaker at my daughters Lehigh University graduation ceremony this past Monday. I am sure that many real science guys in the audience were seething about his global warming claims. Entertainer idiot who would sell his own mother to run with the big boys.. Its a pretty safe bet that nobody is paying him to tell the truth.. So he gets tapped to slip a little left wing indoctrination to the kids that followed his children’s show..
Standard stuff really.. If your politically powerful and completely full of dung the only way to ensure YOUR future is to brainwash the kids ASAP.. Wait a minute, tornados are not driven by heat like thunderstorms, they are driven by cold fronts intersecting a warm front with all the atmospheric instability that the temperature differences cause. This is not the only cause but it is by far the dominate one. Severe convection that results in tornadic activity occurs when two very different air masses collide. The greater the temperatures difference from one side of the front or trigger to the other, the greater the lift, and the more dramatic the weather. So it is our colder than normal weather that has a direct link to the deadly tornadoes that have ravaged the Midwestern states. The scientists can’t figure that out? This is hardly the forum for detail history debates, however this being MEMORIAL DAY weekend, and Bill Nye mention of his WAR HERO father, this a brief clarification is allowable. Chinese Emperor Hsian T’ung did abdicate in 1912, was reinstalled by the Japanese in Manchukuo from 1932 to 1945. He was replaced by pseudo-emporerors, Sun Yat-sen, et al. Japan had been humiliated by the Admiral Perry Black Navy invasion in 1853 and took revenge during the Civil War, seizing the US island territory of Chichi Jima, as the Russian Navy aided the Union blockade, British forces aided the Confederacy and France invaded Mexico. China had been weakened by the European Opium Wars and was invaded in the Sino-Japanese War of 1895-19896, and Japanese Imperialism followed with the Russo-Japanese War of 1904-1905, the Manchurian Invasion in 1931 and of China proper 1937. There was a brief news item last summer on ~$200 billion in US Gold Certificates found by customs officials on the Italian-Swiss border, and reputed to be the from the original Chiang Kai-shek transferred reserve. We are fed far more faux history than faux science, skeptics should be welcome in both camps. Thanks to all veterans, and as a tribute, all Americans are requested to read just one book, on one war, or one battle, or one HERO….and reflect on the Truth they sacrificed for you to find. There has been centuries long war of Imperialist destruction vs empirical Truth….and as the youtube video explains….”All Wars Are Bankers Wars”. Peace. Every time read something like Mr. Olson wrote, it makes me think that he is either a troll here to try to make us look like the conspiracy nutters that the CAGW crowd (Cook/Lewindowski) say we are. Either that or he is just nuts. The sad thing is that many more people get their climate information from Bill Nye on CNN than from this blog or other sources that have a more scientific approach. He also claimed 10 of the last 12 years are the “warmest years recorded. Did he forget about 1998? Another fact that may be of interest: With RSS, 2012 ranks 11th, and 2011 ranks 13th, and 2008 is 22nd. So three of the last five years are not even be in the top ten! True sign of a troll is anonymous post name like “Tom R, Worc, MA” with no web link. I use my REAL NAME, i’ve been a Registered Professional Engineer for 29 years and have a life long passion for knowledge, with a reading hobby in science and history. I’ve read literally thousands of college level texts. I’ve been to Europe eight times, sailed the Nile for three weeks and toured vast portions of America and Mexico. I have authored +150 major articles on science and history with 61 in archive at Canada Free Press, dozens posted at Drudge Report, Brietbart, Climate Depot and cross linked to tens of thousands of websites in 25 foreign languages. My post name has direct web-link to my articles and other media presentations. Zombies need not be bothered by “conspiracies” so you can return to your pre-comment coma, sanctimoniously snug about protecting your fellow zombies from a “nutter”. I do not write for zombies….real humans KNOW that we have a defective “reality”…. People always joke about zombie apocalypses, but the funniest thing is we already have one. It just isn’t the same kind as the ones in the movies. Basic meteorological misunderstanding here. Cumulonimbus clouds (and thus tornados) are NOT driven by heat, they are driven by a difference in temperatures (preferably hot at the bottom and cold at the top, with a large lapse-rate). This is why you can get severe weather on very cold planets and moons. Remember the average IQ is 100 that means 50% of the voters are not exactly the sharpest knifes in the drawer and get most if not all of their information from TV. They really do not care about the ~16% with IQs above 115 who have the curiosity and reasoning ability to look behind the propaganda. A lot of other adults are too busy trying to earn a living to even pay attention to what is going on except for maybe a half hour of main stream news in the evening. That is why propaganda works so well. I have to agree with this. Not for nothing does Private Eye refer to him as Piers Moron. This is so sad. I used to think Bill Nye was smart. What the hell happened to him? It is much more easy to sell snake oil then to explain unpopular plain science based on data and get all the flak from cultists. With the politic correct culture, it is more important to say politic correct sentences then to say the truth – this seems to be the guideline for many public figures. The question is if he is so stupid no to understand or so indifferent not to check the truth of the statement, so used to the snake oil mantra that he is no longer able to discern the truth or he doesn’t care? I guess you’re right, badbeta. It just makes me so sad. I chose a path in science largely based upon Nye and his goofy TV show. I loved it and loved everything he did. Some of the stuff he did on that show was like magic before I learned how to do it. Heck, some of it is like magic even today, even though I’m a chemical engineer now and know how to do them all now. He did so many cool and fun science tricks. But now he’s wasted that all with his belief in ‘consensus’ science as if that were a real substitute for ACTUAL science. So sad. I’m so sad that it’s painful. I really liked him – kind of like a father figure. Don’t you still believe in the scientific method, Bill? It just feels like a big loss. I’ll get over it I guess, but not quickly or easily. He was a big part of tv science. Now he’s a tool :(. Question: If you have two identical silica glass bottles (closed to the air), except one is filled with nitrogen/oxygen, and the other with 100% CO2, and you put them in identical sunlight for the same amount of time, which bottle interior will be warmer and why? Would it be unreasonable to say that the one with some oxygen in it would be WARMER? Yes, I said warmer. The glass in each bottle would block the UV and IR components of the spectrum of sunlight equally. According to the absorption spectrum info below, oxygen appears to absorb a tiny bit in the visible spectrum (400-700 nm), whereas carbon dioxide does not. Hence, the gases in the nitrogen/oxygen would tend to warm relative to the CO2 bottle. What the hell is Nye on about, anyway? Tornados simply aren’t driven by heat. They’re caused by discontinuities in a laminar flow of wind across the landscape.